NAWIC Pikes Peak Chapter 356 General Membership Meetings are usually held on the third Thursday of each month. Guests are welcome to join us! Cost: There is no cost for the meeting. Attendees will be responsible for ordering their own meals off the standard restaurant menu. The cost of sponsoring a meeting is $50.00. This fee covers the expenses for our guest speaker. In addition, as a meeting sponsor, you will have the opportunity to advertise your business or product and give a 5-10 minute presentation. 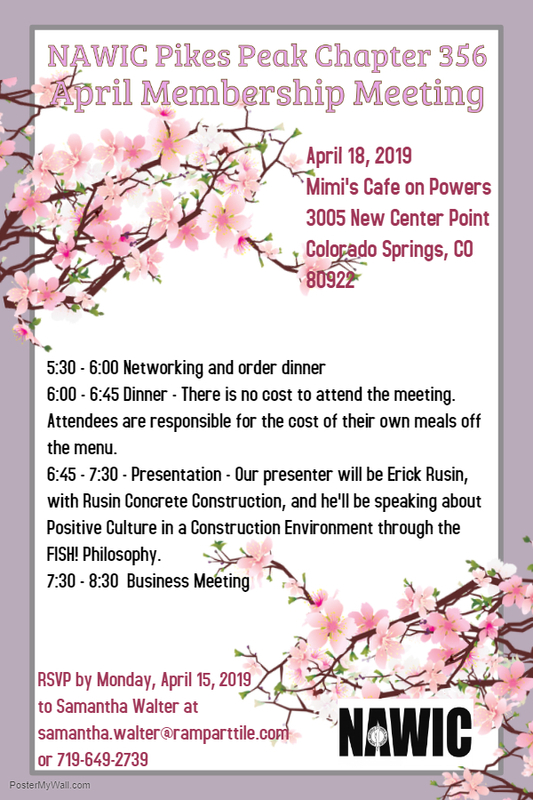 If you would like to sponsor one of our meetings, please contact Valerie Bates at 719-649-4615 or e-mail her at ValeriePP356@outlook.com. Congratulations to the following members for their May chapter anniversaries: Christina Townsend (4 years), Jennifer Walker (4 years), Eva Cosyleon (3 years) and Danielle Grover (1 year)!